How has Lindsay missed this? Congratulations to Sam Mitchell, who with his 44th disposal has now recorded the highest individual disposal count in a preseason game. The intensity has fallen out of the game, but Hawthorn continue to punish North's 29 unforced turnovers. They have generated 20 scores from intercepts with 12 being created in the attacking midfield. 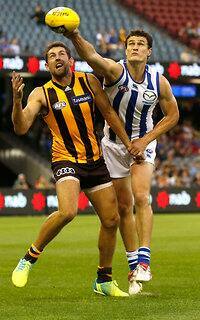 Although the clearances have remained on par, Hawks have hammered North Melbourne in the second half. Their disposal efficiency is 20 per cent better and they have ten more intercepts, resulting in a 11353 advantage in the disposal count. On the back off 20 moreinside 50's, Luke Breust has relished with ten score involvements and 15 disposals with 66 per cent being contested. North Melbourne's inability to transition from their defensive half has hurt them. They have made 15 unforced turnovers in their defensive half, whilst Hawthorn have made just 2. Hawthorn has launched 12 goals to 1 from this source! 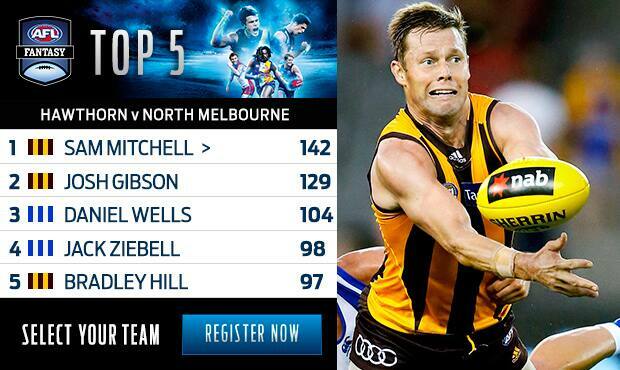 Sam Mitchell continues to show the class of a 3 time Brownlow Medal runner up. He has 37 disposals and is seven away from breaking the all time preseason record. Hawthorn InterchangeLiam Shiels off due to an injury. Todd Goldstein has once again proved his worth to North Melbourne. He has 12 hitouts to advantage, three clearances and has launched four more scores than any other player. Last season, North were ranked sixth last for conceding scores from clearances. 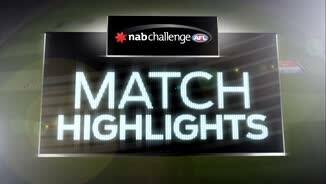 This quarter they are yet to score a goal from nine clearances, whilst Hawthorn has launched four goals from 13 clearances. Hawthorn are running away with the game. They are winning the have created 9 intercepts in their attacking half compared to 1 for North Melbourne. Subsequently, they have scored five goals to one from intercepts this quarter. Hawthorn's senior figures have come to the forefront in this game. Sam Mitchell and Josh Gibson have 26 and 20 disposals respectively, 10 intercepts collectively and 11 handball receives each. Hawthorn has five of the last six goals and the biggest lead of the match. Their disposal efficiency is 16 per cent higher than North Melbourne, who have four unforced turnovers this quarter. Since quarter time, North has made 20 tackles to the Hawks 9. However, Hawthorn is leading the contested possession count by 12 and have 6 more intercepts resulting in two more scores from intercepts. Hawthorn has won four of the first five clearances. They are leading the disposal count by 20 to 6 and have created 6 more handball receives. All thee of these goals have been launched from the midfield. After scoring just one goal from fourteen clearances in the first half, Hawthorn has converted their first two clearances into goals. Last season they generated a score from 28.3 per cent of clearances. Despite the efforts of Sam Mitchell, who has 20 disposals and is on track to surpass his preseason record of 39, North lead narrowly by 7. Daniel Wells has been a major contributor with 6 clearances and six score involvements. Daniel Wells and Andrew Swallow have created more than 50 per cent of North Melbourne's clearances, including all five this quarter. North now have a four goal advantage from this source so far. Hawthorn are winning the disposal count 4423 and inside 50's 8-2 this quarter, they generated two goals from intercept possessions. Last season they were ranked number one in the competition for creating scores from intercepts. Hawthorn continue to be clinical from intercept possessions. They have created a score from 50 per cent of their 12 intercepts in the attacking half of the field. Daniel Wells has been highly influential with 10 disposals, 3 clearances, four score involvements at 100 per cent disposal efficiency. The game is in the balance at the moment. Both teams have exactly 101 disposals. North are winning the clearance count by just two and have created just one extra scoring shot. Since the 14th minute mark of the 1st quarter, North's disposal efficiency has been 81 per cent compared to Hawthorn's of 35 per cent. That quarter was all about momentum. Initially, Hawthorn created six scores from fourteen intercept possessions. However, North rebounded at the halfway mark. They dominated the clearances, holding a four to zero goal advantage from this source. North Melbourne are winning 66 per cent of clearances have four players with two clearances. There disposal efficiency of 73 per cent in the attacking half has enabled them to generate a goal from 36.3 per cent of clearances. Luke Hodge's pressure and impact in the attacking half has been important. He has nine disposals, three score involvements and five pressure acts. Since the 14th minute mark, North's disposal efficiency has been 94 per cent. They are also winning the clearances 10 to 5 and have generated three goals from this source and now have the lead. North Melbourne are struggling to maintain possession. Their kicking efficiency is just 52 per cent and they have had three unforced turnovers in their defensive half, two of which have resulted in Hawthorn goals. Todd Goldstein is demonstrating his dominance in the ruck with three hitouts to advantage. As a result, they are leading the clearances 5 to 3. However, Hawthorn has punished the six turnovers they have made with three goals. In this quarter, Hawthorn has launched all four of their scores from intercept possessions. They have three intercepts in their attacking midfield, all three of have been converted into scores. 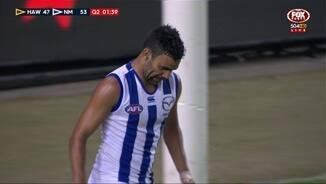 North Melbourne has won the first two clearances of the game and generated one goal. But, they also have two turnovers, which have both been punished by a goal and a behind to Luke Hodge. Since 2010, Hawthorn has generated a goal for every 31 per cent of inside 50's against North Melbourne. This is the highest percentage of any team North Melbourne has played over this period. Last time these two teams played, Nick Dal Santo recorded a game high 35 disposals. Whilst, Jack Ziebell averaged 15 contested disposals per game against the Hawks in his last five matches. Welcome to Etihad Stadium for the Hawthorn v North Melbourne Round 4 clash. HAWTHORN has fine-tuned its 'four-peat' preparations with an impressive 45-point win over North Melbourne on Saturday night, a victory that was set up by a vintage third quarter and a 45-possession haul by evergreen midfielder Sam Mitchell. North led the Hawks by seven points at the main break after a hard-fought first half at Etihad Stadium, but the reigning premiers found another gear in the third term, ramming on seven goals – including two supergoals – to the Roos' two to set up a 2.16.11 (125) to 0.12.8 (80) victory. Mitchell toyed with the Roos at times through the midfield despite the attention of North tagger Ben Jacobs, while fellow veteran Luke Hodge was just as effective in the first half (17 disposals and one goal) before the Hawks took the luxury of resting him for the final two quarters. The Roos took the game right up to the Hawks in the first half and would have been buoyed by the continued good form of Daniel Wells (a team-high 24 possessions and one goal) in his return from two injury-plagued seasons. However, the Roos struggled to move the ball fluently when Hawthorn upped its pressure in the second half, regularly turning the ball over by foot. Todd Goldstein sent a scare through North supporters late in the second term, when he went to the interchange bench and received attention from trainers, who seemed to be assessing his lower right leg. But the 2015 All Australian ruckman played out the remainder of the game and finished with 13 possessions, 28 hitouts and one goal to be one of North's best players. Hawks assistant coach Cameron Bruce, who was in charge of the coach's box on Saturday night, said the game had rounded Hawthorn's pre-season preparation off nicely. "Certainly we got out of it what we wanted from a game-time point-of-view, getting exposure to a really competitive game with our senior players (and) with guys that are looking for an opportunity to cement a spot in the side," Bruce said. "We were challenged throughout that first half … those little challenges that happened throughout the game was great preparation." 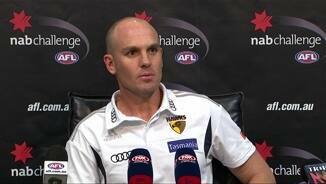 But Bruce said the Hawks coaching staff had yet to settle on their forward-line structure for round one. "There's guys who have put their hands up that we've seen exciting things from," he said. "I mentioned the word synergy yesterday, but hopefully that comes together and we're potent without 'Roughy' there." Hawk forward James Sicily had an opportunity to press his case for a round one berth in the absence of injured vice-captain Jarryd Roughead. With one of the other possible Roughead replacements Tim O'Brien overlooked for Saturday night's game, Sicily kicked twogoals, but the contested marking of ruckmen Jonathon Ceglar (two goals) and Ben McEvoy (one) against the Roos underlined the fact the Hawks aren't short of options to fill the hole left by Roughead. Luke Breust kicked four goals for Hawthorn, while Josh Gibson racked up 31 possessions in the back half. Emerging Hawks midfielder Billy Hartung received treatment after copping a knock to his left knee early in the second quarter. Hartung played out the quarter, but spent nearly all of the second half on the bench seemingly as a precaution. 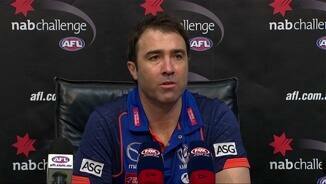 North coach Brad Scott said his team would have to tidy up its ball use ahead of round one. "The obvious thing from an improvement perspective is just far too many blatant turnovers, particularly where they hurt you in your back half," Scott said. "They're things that are not acceptable and we'll have a good look at the reasons why, but I know that you don't lose your skill level from one week to the next. "That was probably the main difference between the two sides. We were OK in the clearance area, but we got beaten in the contest I thought and then beaten on the spread. Drew Petrie was one of North's best players, kicking a team-high three goals before being rested in the final term. North skipper Andrew Swallow battled hard all night at the stoppages, while Jamie Macmillan kept his composure in defence despite the Hawks' dominance. 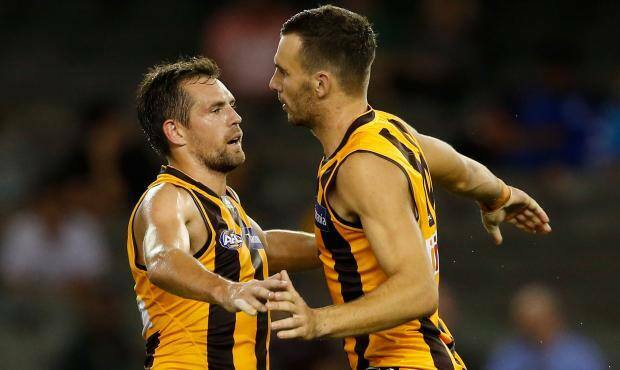 Hawthorn: It's been an experimental Hawks' forward line minus Jarryd Roughead during the NAB Challenge, but with Jack Gunston back we got our best look at what Alastair Clarkson is thinking - and Luke Hodge could be central to his plans. The skipper was stationed up forward for lengthy periods in the first half and Hodge's aerial ability makes him a difficult match-up, not to mention the obvious leadership he will bring to the attack. North Melbourne: The Roos' best line-up looks settled and, importantly, set to be fully fit leading into a huge round one clash against Adelaide at Etihad Stadium. Daniel Wells was typically slick in his second game back, while Shaun Higgins (knee) and Robbie Tarrant (back) should be fine to take on the Crows. North hasn't won a season-opener in six attempts under Brad Scott, but there seems no better time for the Kangas to make amends. Hawthorn: Crafty half-forward Blake Hardwick spent the first half on the bench but got a run immediately after the long break and presented at the ball strongly. Hardwick confidently kicked a late set shot goal and a 2016 debut seems a realistic target for the draftee. North Melbourne: It didn't take long for Jed Anderson to face his old club for the first time, a match the classy youngster would no doubt be happy to have out the way. Anderson produced some cameo efforts, dumped good mate Bradley Hill in the third quarter and was lively forward of centre. NEXT UP It's time for the real deal, with the Roos set to host Adelaide at Etihad Stadium in search of their first round one win in their seventh season under Brad Scott. Hawthorn has a lengthy 16-day break before an Easter Monday blockbuster against a rejuvenated Geelong at the MCG.